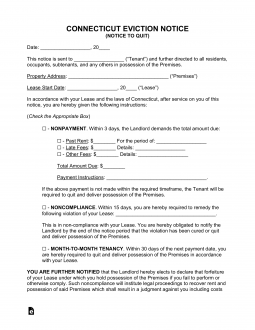 The Connecticut eviction notice forms are used when there is a tenant in possession of a landlord’s property who is either in breach of the lease or whose rental term is ending and not being renewed. In Connecticut, before a landlord is allowed to evict a tenant, he or she must provide a Notice to Quit to the tenant letting them know of their breach in the agreement or to vacate the premises if it is a month-to-month lease requesting termination. If the tenant fails to cure the issue or vacate the premises at the end of the written time-frame, the landlord must file a Summons and either a Complaint for Lapse of Time or a Complaint for Non-Payment of Rent with The Court and include a fee in the amount of $175. Guide to Eviction – Use as a Landlord as a template to follow when going through the eviction process. 3-Day Notice to Quit Possession (Non-Payment & Non-Compliance) – According to § 47a-23, requires the tenant to fix the issue, whether it is for not paying rent on time or another type of lease violation, within three (3) days. Month to Month Notice to Quit (30-Day Notice) – Connecticut law does not specify an exact amount of time required for canceling a lease, therefore the landlord and tenant should view their signed agreement. Step 1 – Landlord must provide a notice to the tenant to leave the premises. Notice must be served by a process server. If tenant fails to pay all rent or vacate the premises within three (3) days of notice (for unpaid rent), the landlord may move to the next step. Landlord will have to pay the fee of $175 to the court as well. Step 3 – Once the forms have been filed with the court, the clerk will assign a return date. You must have copies of all the documents served on the tenant by a process server and return the Service of process to the court four days before the return date. Step 4 – If the Tenant fails to respond within two days after the return date, the Landlord may file a motion for default judgment. If the Tenant failed to respond, then the landlord can file a Motion for Default Judgment for Failure to Appear. If the Tenant fails to answer the complaint, the landlord can file Motion for Default Judgment for Failure to Plead. This form will require items of information reported on the Lease Agreement to appear exactly as they do on the Lease itself. Make sure to have the Lease or the copy of the lease at hand for easy reference. The Connecticut Notice to Quit is available as a PDF, ODT, or Word file. You may download your preferred file type by selecting one of these buttons on the right (beneath the image). We will be filling out the PDF form so make sure you have a form friendly browser (such as Firefox or Internet Explorer) or PDF program. You may fill this out on the screen using such a program or simply print this form then fill it out. The first line of this document shall require the recipient to be identified. Fill in the full Legal Name of this individual. Note: If the recipient is a Tenant or Subtenant, listed on the lease, then report this Name as it appears on the Lease. The Signature Date on the Lease will need to be documented as a means of identification. This will require the individual components of the Date input in the appropriate areas. In the second statement locate the words “lease agreement signed on…” then enter the Calendar Date, Month, and Year of the Signature Date in the appropriate areas. The next area will contain five check boxes. You will need to select the appropriate one. Most of these items will require additional information. If the Landlord is giving the Tenant three days to rectify a Past Due Lease or surrender the rental, then select the checkbox labeled “Nonpayment.” If the Notice is being served for this reason, you must report the Name of an Authorized Agent to accept the Past Due Payment, the Dollar Amount of the Past Due Amount, and the Time Period that requires Payment on the blank spaces available. If the Landlord is giving the Tenant three days to remedy a breach in terms or vacate the property then, mark the checkbox labeled “Noncompliance.” Enter the Lease Term(s) that has been violated, as it is listed on the Lease, on the blank line provided. If this Notice is being issued by the Landlord of a Month to Month Tenancy, the first checkbox labeled Month to Month Tenancy should be selected. The Calendar Date the Lease will end must be listed in this paragraph. Note: This Date must allow for thirty full days to elapse between the Date of Receipt and the Termination Date. If this Notice is being issued by a Tenant to a Landlord to end a Month to Month Tenancy, then place a mark in the last checkbox of this section (preceding the words “Mont to Month Tenancy – I am your Tenant”) and report the Date the Lease should terminate on the spaces provided. Note: Thirty Days must elapse between the receipt of this Notice and the Date the Lease will Terminate. The Agent who has agreed to serve this Notice to the recipient must document precisely how that was done then Sign his or her Name as a verification. Report the Date this Notice was served and to who this Notice was served in the appropriate areas of the statement. Below this, the Agent must check the first box if this Notice was delivered personally, the second box if it was delivered to an appropriate second party (of age household member or co-worker), or the third box if this Notice is being sent First Class Mail to the recipient. The Agent Signature must be provided on the Signature Line at the end of this section.